I'm designing a simple Signal Generator and could use some thoughts on its output stage. Its intended application is to tinker and play with on my workbench, hence it need not be overly sophisticated or fancy. The front end is an Analog Devices AD9833, a DDS Signal Generator chip, for Sin, Square, and Triangle waves, from essentially DC to 10 MHz. The User Interface will be a Mega168, an LCD, a bunch of push button switches, plus Gain and DC Offset controls. I' feeding the signal through a buffer, two variable gain amps, and a stage to add a variable DC offset. The signal then goes to a final output stage op amp. I'm using an AD826 Op Amp because it is a heck of a lot easier than a 10 MHz transistor design (for me, anyways), and my workbench needs are not very demanding. I also have a few of the chips already in stock. 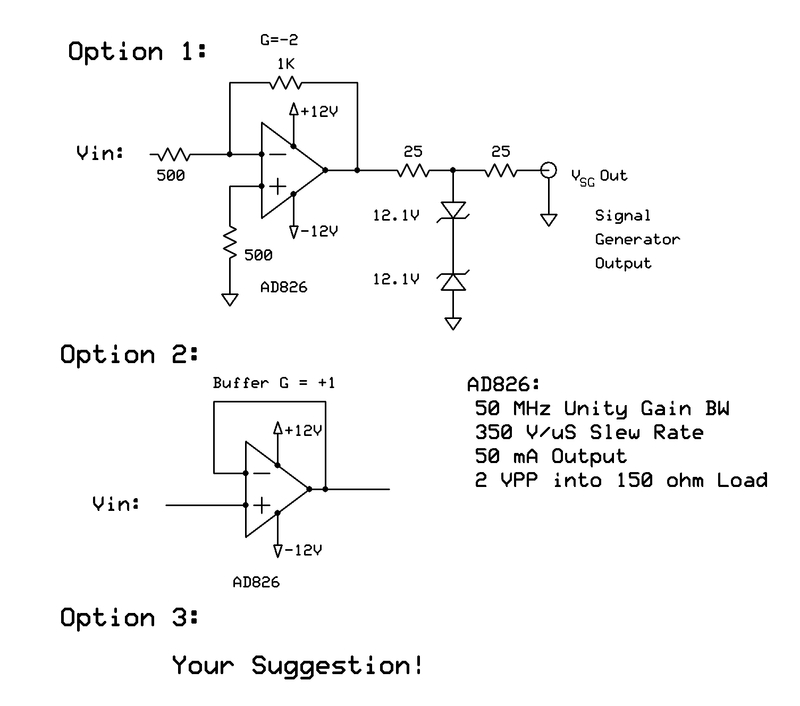 My first thought was to just use a simple voltage follower for the output, a unity gain buffer, as shown in Option #2, below. My second thought was to insert a 50 ohm resistor, in series, in the output. At 2:00 AM in the morning I can tie the output directly to ground and not hurt the op amp. Presumably this is a low enough impedance to not significantly impact my output signal for routine tinkering on my bench. Next I thought about splitting the 50 ohms in the output, and clamping it with a pair of stacked zeners, (or maybe a TransZorb). With this I can also protect the op amp should I unwittenly attempt to inject some impulse > +/- 12 V Backwards, into the signal generator. Try one of the op-amps specifically made for video. The AD826 is one of those. You can tell by the specs (2Vppk into 150 ohms). Be aware that many of the high bandwidth op-amps are "current feedback" and have an optimum feedback resistor value. They are also often optimized for a gain of 2 non-inverting (because that is what video often needs). I think that is the case for this one. In this situation, 1X non-inverting is not good. The zener voltage protection scheme is questionable because zeners have a lot of junction capacitance. You did not say what ppk signal you want into 50 ohms. Lets say 5V (Option 1). Then, the op-amp has a 10V ppk signal at its output. The 350V/us slew rate spec means that the square-wave rise/fall time will be about 10V/(350V/us) = 28ns (actually, for 10-90% rise/fall time, maybe 25ns). With a sqaure-wave frequency of 10MHz, that is a period of 100ns, and each half is 50ns. Thus, the rise/fall time will be close to half of the half-period. For a box like this, that would not be too bad. For a 50 ohm output, 50ma means 2.5V (+ or -) so you could maybe get 5V ppk out. But, that is 5V combined signal and offset. Thank you for the feedback. I had not given much thought to the Zener's junction capacitance. I'll remove them to avoid their dampening the square wave slew rate even more than the op amp... I'll just have to pay more attention to what I connect the signal generator to! The current design is Gain = -2, I'll look at the data sheet (again...) and consider a G=+2 output stage instead. I appreciate your taking the time to look it over! Any other input is certainly also welcome! You can use fast diodes instead zener diodes connected between OP's output and +/- power supply and keep only one resistor 25 - 50R. Any particular diodes in mind? Even in that configuration I'll still have to pay attention to the load they present to the output, as Jim pointed out above. Thanks for taking a look at the circuit! I would vote for stability and robustness. drive inductive, capacitive, resistive loads. perhaps it's easier to put 50 Ohm "in". with low-z output are mor in the "below 1MHz" region. output to long (!) cables. The next problem is the "fidelity" of the output. Perhaps one can learn from them. The fast diode for output protction should be about 1 A types. There are lots of them around (UF4001,...). If someone puts more than 30 volts external voltage to the output, the 25 Ohms resistor will probably work as a fuse if the rigtht type is choosen. In Addition there should be transsorbs in the supply voltage then. Even a low impedance output should have a small series resistor (e.g. 5 Ohms), that helps to keep the output stable. Possibly a second, low frequency only, low impedance / high current. All good thoughts, thank you for your input! The decision to include the 50 ohm output resistor or not was a difficult one for me to make, and I'm not sure I fully understand the consequences either way. In my low freq / audio freq circuits, as you mentioned, one would typically want just the op amp driving the output. 10 MHz and the op amp data sheet made me wonder if this was still a good approach or not, hence the post. The more I read, study, and ask, the more I realize I don't know, which makes it a good learning project. My tinkering at 10 MHz once again reinforces my total respect for RF engineers, especially those working UHF and above! Commercial function generations usually have 50 ohm output. Direct connection to reactive loads and resulting stability issues certainly ARE a problem. Even a piece of coax cable, at "audio" frequencies, can do it. My personal experience is that, at audio, 50 ohms is small enough relative to normal impedance levels that you can almost ignore it (with respect to time constants, and such). it will almost always be dominated by something else. I would keep the output series resistance split, and use cheap 1N4148 diodes as clamps to +12 and -12. In addition, I would place fat zeners on the +12 and -12V rails. That way when you apply 24V to the input, the outer 25 ohm resistor takes most of the power and burns open first. 1206 SMT is good. The +12 and -12 rails should have decoupling caps to output ground in order to be able to catch ESD. 50 ohm output is nice to have. If you connect 5m of RG58 between your scope and the generator, with 50 ohm source termination you'll get a flat response, even though the scope is a high impedance input. If your output jack is specified as "1V EMF / 0.5V into 50 ohm", you will see 1V on the scope at all frequencies. If your output is low impedance, you'll see a nasty cable resonance near 10MHz (10MHz = 20 meter wavelength in RG58, 1/4 wavelength=5m) where the amplitude on the output end of the cable grows, which if applied to an AVR's clock input would likely mean a dead AVR. Sorry, I missed your post while responding to Ossi. While contemplating this I was just considering adding another op amp for dual outputs, one low-Z, one with 50 ohms. But then why not just have a dongle with a 50 ohm resistor for the output, if one is driving a 50 ohm cable, etc. Lots of options, none of them 'wrong', just some better than others, and determining which is the optimal is part of the design challenge. Adding a 5 ohm series output resistor to a Low-Z output is certainly a good idea, until you mentioned it I was thinking all of none, (50 ohms or 0 ohms). As Jim pointed out, adding protection circuitry will impact the frequency response of the output. Conflicting goals here, as I'd like to protect the signal generator from my inadvertant blunders, while not totally degrading the square wave output. It looks, however, like the slew rate of the AD826 op amp may be the biggest factor in the system's bandwidth. I am more familar with the 1N4001 series than the UF4001 series diodes. They both have about the same junction capacitance, 15-17 pf, at 1 MHz, but the UF series is obviously a better choice for this application. Perhaps make a board with the pads available, and test two boards side by side, with and without protection diodes to clamp the output. Built a signal-generator with 50 Ohm output. (perhaps for 0..50kHz) and feed it from the signal-generator or other sources. Wow, a quick check shows the junction capacitance of the 1N4148 is 4 pf, ~ 1/4 that of the UF series, and also a "fast" recovery time. Angelu also liked clamping to the power rails better than the stacked zeners on the output. You and Jim both make strong arguments in favor of the 50 ohm output source impedance. It is easy to add additional caps at the output ground for ESD protection, yet another area I had not given much consideration to, but will now! Thank you, again, to everyone for their insight!